CHICAGO--(BUSINESS WIRE)-- An affiliate of Hyatt Hotels Corporation (NYSE: H) announced a management agreement with Essendon Fields Pty Ltd (EFPL) for a Hyatt Place hotel in Melbourne, Australia. Upon its expected 2017 opening, Hyatt Place Melbourne will be the country’s first Hyatt Place hotel. Hyatt Place Melbourne will be located in the Essendon Fields development, which is quickly becoming the epicenter of business in Melbourne’s northwest region, and guests of the hotel will enjoy convenient access to Tullamarine International Airport. Just six miles form Melbourne’s Central Business District, the hotel will be situated on one of Melbourne’s most important roads, the Tullamarine Freeway, which is used by more than 100,000 cars every day. “We are delighted to bring the Hyatt Place brand to Melbourne, and are honored to start our relationship with EFPL, a joint venture between Fox Group Holdings and Beck Corporation, two of Australia’s most prominent developers,” said Robert Dawson, Hyatt’s area vice president for the Pacific region. The eight-story, upscale select service hotel will offer the brand’s signature spacious rooms, which will each feature a Cozy Corner, a 42” flat screen TV, and a comfortable bed. Additionally, guests will enjoy the brand’s signature free hot breakfast, food freshly prepared around the clock, a full bar, and high-end technology, including complimentary Wi-Fi and adaptable spaces for business and social events. The hotel will be adjacent to a stand-alone conference facility that will accommodate up to 420 people, a more than 5,300-square-foot (500-square-meter) exhibition hall and an 80-seat restaurant and bar, which will be operated by one of Melbourne’s leading independent conference center operators. The Hyatt Place hotel will be part of the Melbourne’s economic expansion – with transportation infrastructure, housing, employment, and migration growing, the city is undergoing a transformation. 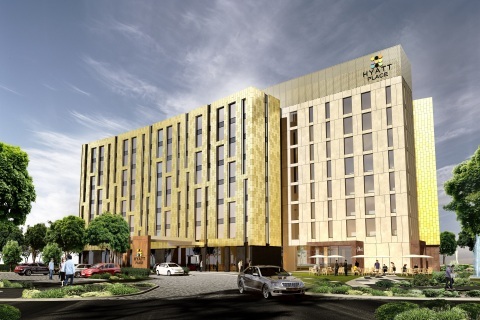 Hyatt Place Melbourne Essendon Fields will join five Hyatt-branded hotels in Australia, including Park Hyatt Melbourne, Grand Hyatt Melbourne, Hyatt Hotel Canberra – A Park Hyatt hotel, Park Hyatt Sydney, and Hyatt Regency Perth.